Inflammation is a desirable complex process by which the organism controls and repairs effects of noxious stimuli. Efficacy of the organism in ameliorating the undesirable effects of inflammation is measured by decreases in the four cardinal features of inflammation, pain, redness, heat and swelling, is with the ultimate aim of preventing loss of function. 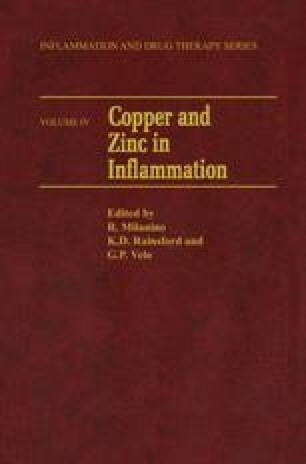 Experimental studies teach that copper and zinc are fundamentally involved in the expression and control of inflammation. How copper and zinc metabolism changes in inflammatory states and how inflammation modulates the organism’s fluctuating copper and zinc levels are discussed using examples from laboratory experiments and from natural experiments such as rheumatoid arthritis.